The EPA hosted field hearings in four cities – Washington, D.C., Denver, Pittsburgh and Atlanta – to hear public comments on the rule. 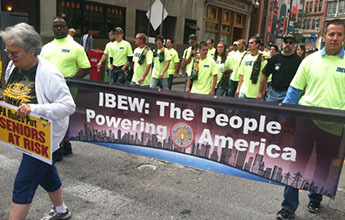 More than 5,000 members of the IBEW, the United Mineworkers and the Boilermakers took to the streets of Pittsburgh July 31 to protest the Environmental Protection Act’s Clean Power plan, which they say will kill good jobs and weaken the electrical grid. “If these rules are implemented as written, dozens of coal plants will shut down and with no plans to replace them, tens of thousands of jobs will be lost and global emissions will rise anyway,” said International President Edwin D. Hill. The agency held field hearings in July in four cities – Washington, D.C., Denver, Pittsburgh and Atlanta – to hear public comments on the rule. Dozens of IBEW members testified on the negative impact the plan will have on working families and the energy grid. The agency estimates that the plan will shutter more than 40 gigawatts of coal-generated power by 2020. Despite the growth of renewable energy in the last decade, solar and wind still provide less than 5 percent of the country’s electricity. Shutting down dozens of coal plants in a short amount of time makes it difficult for utilities to keep the power on during bouts of extreme weather, like last winter’s polar vortex system, which produced sustained periods of frigid temperatures. The IBEW’s estimates regarding the impact of previous EPA regulations have consistently been accurate in comparison with the agency’s overoptimistic predictions. In 2011, the EPA estimated that 4.7 gigawatts of generation would be lost due to plants closing under then-proposed Mercury and Air Toxics rule. Experts now confirm that 56 gigawatts – predicted by the IBEW at the time – will be lost by 2016. "The federal government and Democrats and Republicans in Congress need to hear our voice and come together to craft a serious bipartisan energy plan that grows our economy and reduce carbon emission," Hill said.